The previous post discussed the centrality of ecstasy in the world's ancient sacred traditions, and featured a piece of ancient artwork thought to date to about 440 BC, depicting the mythical encounter between King Aegeus and the Pythia or priestess of Delphi. This artwork is extremely beautiful in its own right, but it also opens an incredible window onto the ancient esoteric system discussed in the past several posts and in my most-recent book, The Undying Stars. The priestess at the famous Temple of Apollo at Delphi was known as the Pythia, because ancient tradition held that the site was originally home to a female serpent or dragon known as Python, which Apollo slew with his arrows to claim the site for his own. The Python slithered deep into a fissure leading down to the underworld and died in agony, and from her body issued fumes which (according to the myth) were responsible for putting the priestess into the trance-condition as she sat upon a tripod in the sacred cave over the fissure. In this altered state of consciousness, she would pronounce her oracular sayings. In the ancient myths, the Pythia is sometimes described as carrying a disc of water from the sacred spring at Delphi, as well as a laurel-leaf (the laurel was sacred to Apollo), both of which were instrumental in achieving the condition of trance or ecstasy. The symbology in the ancient artwork depicting the Pythia, above, is very revealing. It clearly depicts the Pythia in the distinctive seated posture which recalls the stars of the constellation Virgo, which is shown in the upper right of the image above. Note the extended hands of the Pythia, one of which holds the sprig of laurel and one of which holds the disc containing the sacred water, would be immediately recognizable as corresponding to the extended hand of Virgo to an ancient viewer familiar with this important zodiac constellation. Below the star-chart of Virgo in the diagram above is a depiction of the goddess or titaness Rhea, who is also depicted in the same distinctive seated posture, and likewise has a hand extended in identical fashion to the constellation of Virgo. She appears to hold a large hoop or disc above the bowl -- this can also be seen in other depictions of Rhea, such as this one and this one. We have already discussed in this previous post that Rhea is almost certainly a manifestation of the Great Goddess, the Queen of Heaven, who is called Cybele, the Great Mother, and many other titles in many other ancient sacred traditions. The disc held by Rhea or Cybele in these depictions corresponds in its location to the cluster of stars which can be seen in the same area (above the extended arm) in the star chart of the constellation Virgo. The lion portrayed reclining at the base of Rhea's throne almost certainly represents the zodiac constellation of Leo, which appears to be a recumbent lion as drawn in many star charts, such as the one included in this previous post (third image down on that page), although I myself prefer the outline suggested by H.A. Rey which outlines a lion striding forward rather than reclining. 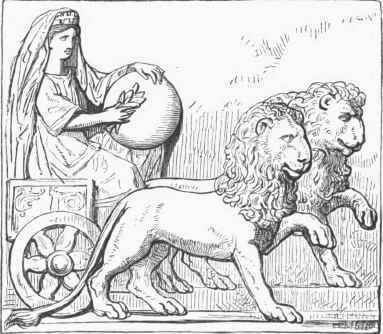 The fact that Virgo follows Leo across the sky each night explains the fact that many of the various manifestations Great Goddess are depicted in ancient artwork as riding in a chariot pulled by lions, or riding upon the back of a lion herself. Returning to the image of the Pythia, then, we see that the disc of water in the ancient painting above appears to correspond to that same grouping of stars seen above the arm of Virgo in the star-chart, which also corresponds to the disc or hoop held by Rhea or Cybele. The sprig of laurel in the Pythia's other hand is also noteworthy, in that it is strongly reminiscent of the sheaf of wheat often associated with the constellation Virgo, and specifically with her brightest star, Spica. This sheaf of wheat is of course also associated with the goddesses Demeter and Ceres. What does all this mean? The diagram below shows the now-familiar zodiac wheel, discussed in numerous previous posts, and one of the most-important keys to understanding the esoteric system of allegory which connects all the world's ancient myths. The earth's annual circuit causes the sun to appear to rise in a different zodiac sign throughout the year, progressing through all twelve zodiac signs during the yearly voyage (for an explanation of this phenomenon using the analogy of the "dining room table," see this previous post and the YouTube video embedded therein). One of the reasons that the constellation of Virgo is so important is that she is the only woman among the twelve zodiac signs, which probably explains why she plays so many different roles even within the same system of mythology (for instance, appearing as both Rhea and Demeter in the Greek myth-system). Another reason that she is so important is her location on the zodiac wheel. In the Age of Aries, depicted above, Virgo is located at the critical point of the autumnal equinox (indicated by the red "X" on the right-hand side of the diagram as you look at it). As explained in this previous post, the ancient sacred traditions often allegorized lower half of the zodiac wheel, in which the nights are longer than days and in which the sun's path across the daytime sky is sinking lower and lower towards the southern horizon (for observers in the northern hemisphere) on its way to the lowest point of winter, as Hell (or as Sheol, Hades, Niflheim, Jotunheim, the underworld, the realm of the dead, the kingdom of Osiris, and in some myths as the depths of the sea). Thus, the constellation of Virgo is located at the very entrance or gateway to Hell, or Hades, or the underworld, or the realm of the dead. Returning again to the description of the Pythia, we note that she sits suspended over the underworld itself (the fissure, from which the fumes and vapors of the Python arise), just as Virgo is poised at the very edge of the underworld in the zodiac wheel. The serpentine constellation of Scorpio, which can be seen to be two stations further down below the autumnal equinox, may correspond to the Python in the legend of Delphi, or the constellation Hydra which is also very close to Virgo in the night sky may correspond to the Python (my bet would be Scorpio). The importance of all of this allegory, however, is very easy to miss. Once you see the connection between the myth itself and the celestial drama of the sun, moon, stars and planets, it is important not to stop there. The ancient sages who imparted the sacred myth-systems to humanity were not trying to trick us when they created these exquisite metaphors. This wasn't just some exercise to hide a bunch of astronomy inside wonderful stories. The stars and planets and signs of the zodiac -- as wonderful as they are to behold and as much as they fill us with awe when we gaze up into the infinite heavens on a starry night -- are not the ultimate focus of these treasures of ancient wisdom that make up the world's sacred scriptures and traditions. They were designed to impart profound truths about the nature of the human condition, and the nature of the cosmos that we inhabit -- and to point us towards what is perhaps best described as "consciousness." The lower half of the zodiac wheel did not only represent hell or the depths of the sea: it also represents incarnation, the state into which a human soul descends when it leaves the immaterial world of spirit (corresponding to the upper half of the zodiac wheel) and enters the material realm. The endless cycles of the stars, planets, sun and moon, rising above the eastern horizon and crossing the sky only to plunge back down again beneath the western horizon, typed the progress of the soul plunging down into matter and incarnation to toil its way through this life and at the end to rise into the blessed realm of pure spirit, only to incarnate again several times in order to experience and learn the things which can only be learned by taking on a body. Whether or not one actually accepts that this is a true description of the nature of human existence and the nature of the immortal soul, there is substantial evidence to support the assertion that this is exactly what the ancient myth systems of the world were intended to express, as discussed in previous posts such as this one, this one and this one. The description of the Pythia, then, is one that teaches us something very profound about the human condition. She is suspended over the chasm of the underworld, exposed to the deadly vapors of the body of the dragon, and she is described as one who is able to enter into a trance-condition and receive divine messages in doing so. In this way, she is very much an allegorical or esoteric depiction of the human condition -- each one of us, in fact, is like the Pythia, suspended at the borderline between the world of spirit and the world of matter. While it may not be correct to say that we should all be able to enter into the trance-state, like the Pythia, and cross over into the other realm, it is probably correct to say that we should acknowledge that we have both a spiritual component and a material component -- we are not only matter, as argued by the strict materialists who wish to deny any transcendent component to human existence or any spiritual side to men and women. It is also true that, even if not every individual has out-of-body experiences or is capable of undertaking shamanic journeys, these are only the clearest manifestations of the fact that our minds have the ability to transcend the material realm. Studies have revealed that positive thinking can have real impacts, for example, on human health -- which means that through something as non-material as thought we can actually create real changes in something as physical and material as our body and our health. Quantum physics also demonstrates that human consciousness can actually impact and influence (in some fashion that is still not even close to being completely understood) the location, and even the past location, of small particles such as subatomic particles and even some molecules. All of these examples (and there are many more) demonstrate that even "ordinary" people have the ability to venture across that boundary between the material and the immaterial realms (just as the Pythia sits at that border between the material and the immaterial, and is capable of crossing it). Some men and women can display more dramatic manifestations of this truth about the nature of human existence, but all of us seem to have some potential for it (and in this way, it is really true to say that there is no such thing as an "ordinary" person). Understanding how to see the celestial metaphors contained in the world's sacred traditions is an important first step to perceiving the profound and incredible messages they were trying to teach us. But once you see the connection (such as the clear evidence that the Pythia was depicted by ancient Greeks using symbology which points to the sign of Virgo the Virgin), it is important not to simply stop there and say, "OK, she's Virgo -- I guess that was the hidden message!" That connection is just the beginning. Clearly, the Pythia can still convey a divine message from the "other realm," if we listen to what she is trying to tell us.